14 April 2019Were we Graced by his presence! In May 2018 I attended a funeral reception for someone who had enjoyed spending summer Saturday afternoons watching cricket from the balcony of the pavilion at the Gnoll Ground. It was a first visit to Neath Cricket Club for me, which under the circumstances, was a pleasant afternoon with the weather very seasonal. I had always known that the great WG Grace had played at the Gnoll and had famously failed to score, but I knew little detail of his visit and decided to take the opportunity to learn more. I began by looking at the dust jacket of 'Old Neath & District in Pictures: Volume 4' by the Neath Antiquarian Society, which shows a representation of the event painted by a young artist named CW Campion (1830-70). 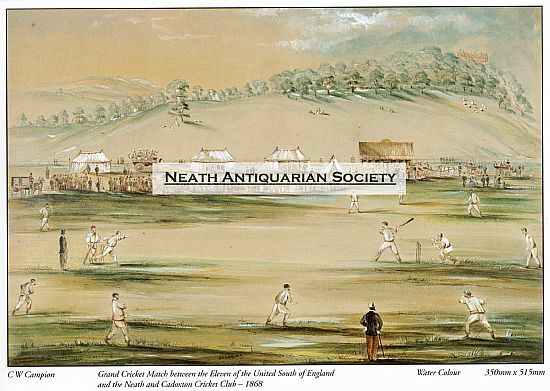 The painting carries the rather wordy title 'Grand Cricket Match between the Eleven of the United South of England and the Neath & Cadoxton Cricket Club under the Patronage of JTD Llewelyn Esq. 1868.' The framed original, a handsome delicately painted piece, is carefully preserved and in the ownership of the NAS. JTD Llewelyn who was captain of the home side (which had twenty-two players) had insisted on the inclusion of Cadoxton in the name of the club for this game. The large meadow belonging to the club was fenced on three sides for the occasion and canvas hoarding, strained on poles, extending more than a quarter of a mile was fixed early on Thursday morning. Members were able to watch the game without payment; non-members were charged two shillings for the three days. Four tents, in addition to the pavilion, were erected on the ground, one especially for the use of the eleven, another for refreshment of visitors, a third fitted as a dining saloon, and the small dressing tent attached to the pavilion being reserved for the twenty-two. A refreshment tent, not connected with the club, was also erected outside the field. Mr. Whittington had erected a printing press inside the pavilion, to report on the progress of the game. The cricket ground itself was like a piece of velvet pile, from the continuous rolling, machine mowing and sweeping which had taken place in the last month. Play began at noon. Neath having won the toss put the opposition in to bat first. ... After an interval for pelting rain, there was a pause for the entrance of Captain Evans' brass band, seated in full uniform in their band carriage. Play resumed briefly but rain once more came down in regular 'Neath Niagara' form and a retreat was made towards the tents and pavilion. Lunch was provided by Mr. Hutchins of the Queen's Hotel and the band played an excellent selection of music during the repast. Play was abandoned for the day as the rain increased in heaviness as the evening drew on. The band lingered behind and continued with its programme until everyone had left the ground. Despite the drizzle, many more spectators turned up on the Friday, especially in the evening. On Saturday a perfect hurricane of wind and rain continued until nearly 12 o'clock. The canvas hoarding around the field was blown down, and considerable damage was done in other parts of the locality. Play was possible in the afternoon and, ironically, by Saturday evening the weather was fine and bright. Both sides wished to play on, but the umpires kept to the rules. Stumps were drawn at 6.30pm and the match was declared a draw. The police arrangements were very simple but admirable. Not the slightest disorder or annoyance occurred throughout. But unfortunately expenses were far in excess of the receipts. The report, of course, carried a comprehensive record of the score for both sides. A point of interest was the umpire's name: Julius Caesar, would you believe! As for WG Grace himself, despite being the leading batsman in England that season, he did indeed fail to score in either innings (one of only four occasions in his long and distinguished career when this happened). As if to rub salt in the wounds, his skills as a fielder were questioned as well! He apparently caught Middleton with 'a catch off the daisies, if it was a catch'. [ouch!]. Having only ever visualised him as a bearded, portly middle-aged man, it came as a shock when I discovered that WG was still a teenager at the time, a couple of months shy of his twentieth birthday. He was born in July 1848, coincidentally the same year in which Neath Cricket Club was founded. Sir John Talbot Dillwyn Llewellyn was the son of photographer and scientist John Dillwyn Llewelyn and Emma Thomasina Talbot, youngest daughter of Thomas Mansel Talbot and Lady Mary (née Fox Strangways) of Penrice. He was created a baronet, 'of Penllergaer in Llangyfelach and of Ynys-y-gerwn in Cadoxton juxta Neath both in the County of Glamorgan', on 20 March 1890. Previous generations of his family had resided at Ynysygerwn House. Sadly, the Queen's Hotel (latterly The Canterbury) closed for business early 2019.